Messier 94 (M94), also known as Cat’s Eye Galaxy or Croc’s Eye Galaxy, is a spiral galaxy located in the constellation Canes Venatici. The Cat’s Eye Galaxy has an apparent magnitude of 8.99 and lies at a distance of 16 million light years from Earth. 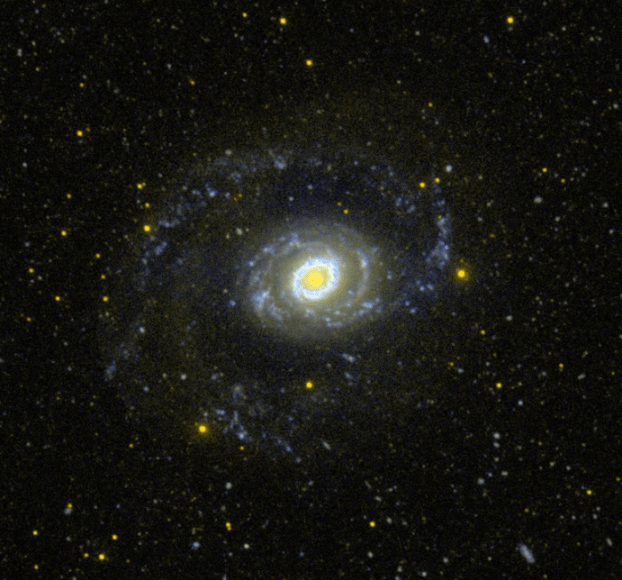 It has the designation NGC 4736 in the New General Catalogue. Messier 94 occupies an area of 11.2 by 9.1 arc minutes of apparent sky, which corresponds to a linear extension of 50,000 light years. The galaxy can be spotted with binoculars under exceptionally good conditions, but only appears as a small, dim patch of light. 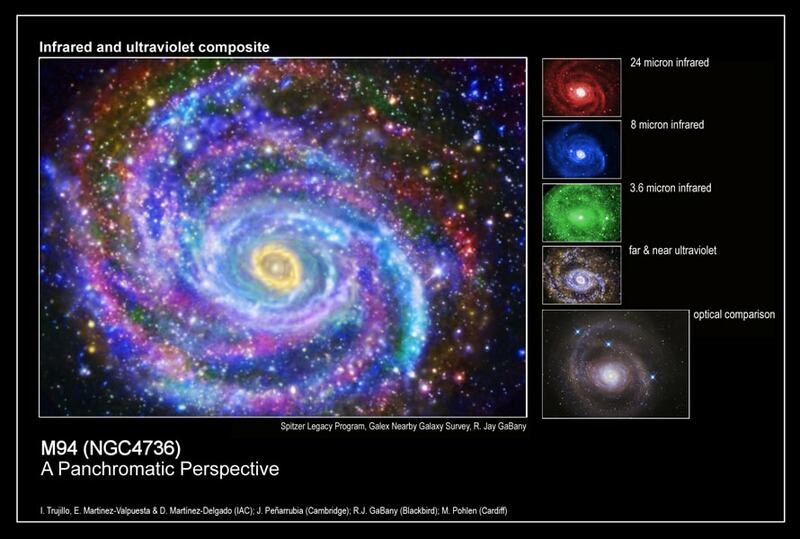 Even small telescopes will reveal the object as a galaxy. Smaller instruments show M94 as a fuzzy patch with a brighter centre, while 6-inch and 8-inch telescopes reveal a bright, condensed nucleus surrounded by a nebulosity that hints at spiral structure. Larger amateur telescopes reveal a bright ring around the galaxy’s nucleus and other details of M94’s structure. 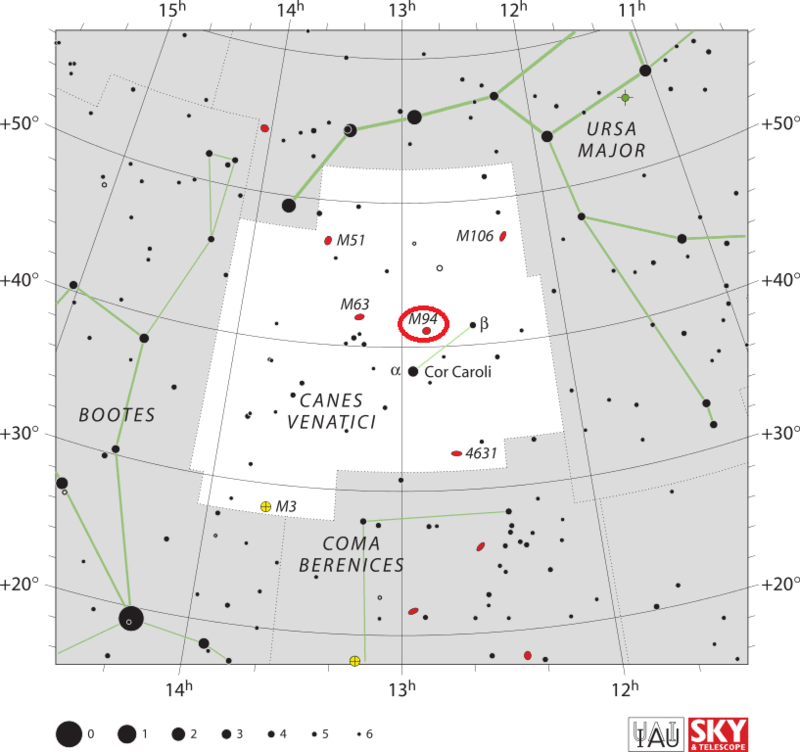 Messier 94 can be found 3 degrees east and a little south of Chara, the second brightest star in Canes Venatici. Chara lies a little more than 5 degrees northwest of Cor Caroli, the constellation’s brightest star. Cor Caroli can be found under Alkaid, the star that marks the tip of the handle of the Big Dipper asterism in Ursa Major. The best time of year to observe M94 is during the spring. Messier 94 is estimated to contain 40 billion stars. The galaxy is receding from us at approximately 308 km/s. Its main disk is about 50,000 light years in diameter, but the galaxy has a considerably fainter outer ring that extends for at least another 30,000 light years. Messier 94 is classified as a LINER galaxy, or a galaxy with a low ionization nuclear emission region (LINER). This means that the nucleus of M94 contains ionized gas, but that the gas is only weakly ionized. Some sources classify M94 as a barred spiral, but the galaxy’s “bar” structure appears more oval-shaped. Messier 94. Based on observations made with the NASA/ESA Hubble Space Telescope, and obtained from the Hubble Legacy Archive, which is a collaboration between the Space Telescope Science Institute (STScI/NASA), the Space Telescope European Coordinating Facility (ST-ECF/ESA) and the Canadian Astronomy Data Centre (CADC/NRC/CSA). Messier 94 has two ring structures. The inner ring has a diameter of 70 arc seconds and the outer one, 600 arc seconds. The two rings are found at resonance locations within M94’s disk. The galaxy’s bar-like structure drives gas into the inner ring, triggering star formation in the region. The outer ring of M94 is not a closed stellar ring, as previously believed, but a complex spiral arm structure seen in mid-infrared and ultraviolet wavelengths. In other words, what appears to us as a ring is in fact a structure of two spiral arms that looks like an unbroken ring when seen from Earth. Observations in 2009 revealed that the outer ring is active and produces about 10 percent of new stars in the galaxy. It also contains about 23 percent of the total stellar mass of M94. Star forming activity in the outer ring is about two times greater than that in the inner ring. 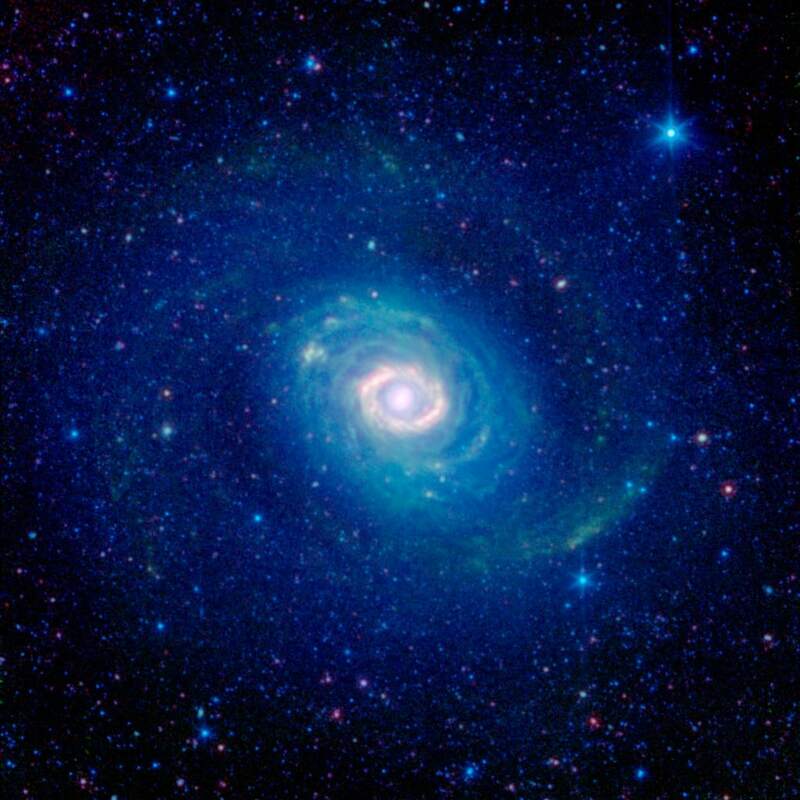 The outer ring was previously thought to have formed when M94 absorbed a smaller satellite galaxy or as a result of interaction with a star system. However, neither of these theories was supported by research and scientists concluded that the inner disk is an oval distortion which led to the formation of M94’s peripheral disk. The inner, starburst ring is a site of intense star forming activity. The ring is believed to have formed in a starburst that occurred less than 10 million years ago. The region contains numerous clusters of young blue stars, revealed in long exposure photographs of M94. Historically, Messier 94 was considered to have two strikingly different rings: a brilliant, compact band encircling the galaxy’s core, and a faint, broad, swath of stars falling outside its main disk. Astronomers have recently discovered that the outer ring, seen here in the deep blue glow of starlight, may actually be more of an optical illusion. 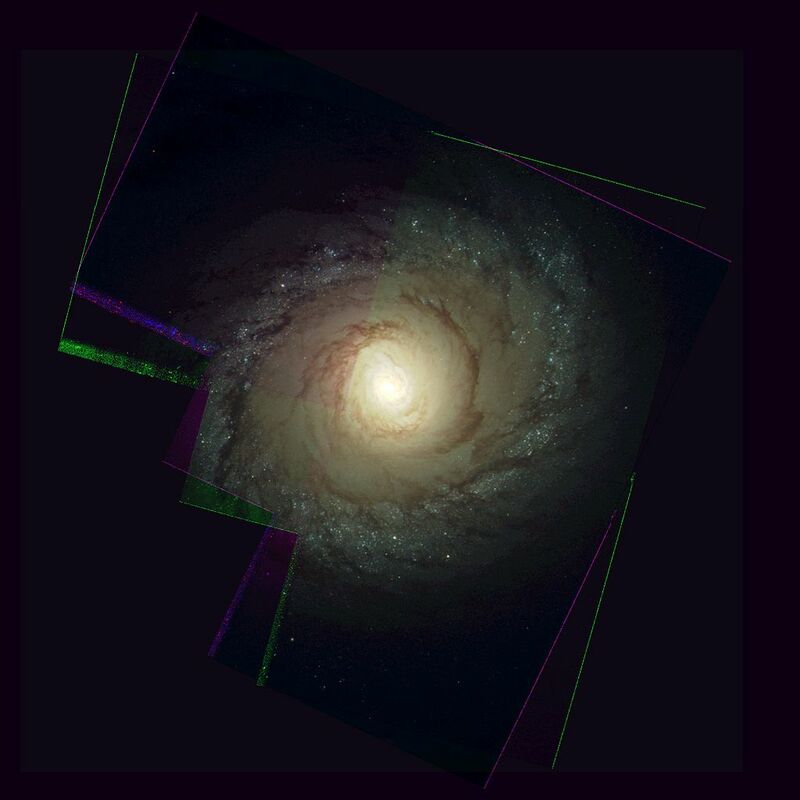 Their 2009 study combined infrared Spitzer observations with ultraviolet data from NASA’s Galaxy Evolution Explorer, and ground-based surveys in visible (Sloan Digital Sky Survey) and near infrared light (Two Micron All Sky Survey). This more complete picture of Messier 94 indicates that we are really seeing two separate spiral arms that, from our perspective, take on the appearance of a single, unbroken ring. The bright inner ring of Messier 94 is very real, however. This area is sometimes identified as a “starburst ring” because of the frenetic pace of star formation in this confined area. Starbursts like this can often be triggered by gravitational encounters with other galaxies, but in this case may instead be caused by the galaxy’s oval shape. Tucked in between the inner starburst ring and the outer ring-like arms we find the galaxy’s disk, striated with greenish filaments of dust. While, at first glance, these dusty arcs look like a collection of rings, they actually follow tightly wound spiral arcs. Messier 94 is about 17 million light years away, making it a distant neighbor of our own Milky Way galaxy. It was first discovered by Charles Messier’s assistant, Pierre Méchain, in 1781 and was added to his supervisor’s famous catalog two days later. John Kormendy and Robert Kennicutt published a paper in 2004 arguing that the galaxy has a prototypical pseudobulge. A regular spiral galaxy has a disk of gas and young stars that crosses a large bulge of older stars. M94, however, does not contain a large bulge of older stars, but instead it has a bright structure in the centre that appears as a bulge when seen face-on and is a site of intense star forming activity. The pseudobulge in M94 takes the form of a ring surrounding an oval-shaped region in the galaxy’s core. Messier 94 is the central galaxy in the M94 Group, also known as the Canes Venatici I Cloud (CVn I Cloud), a group that contains 16 to 24 galaxies. Even though there are many galaxies that may be associated with M94, only a few appear to be members of the group. These include the Black Eye Galaxy (M64) and a number of fainter members. M94 is the brightest member of the group, but does not appear to be gravitationally bound to any of the galaxies in the vicinity. 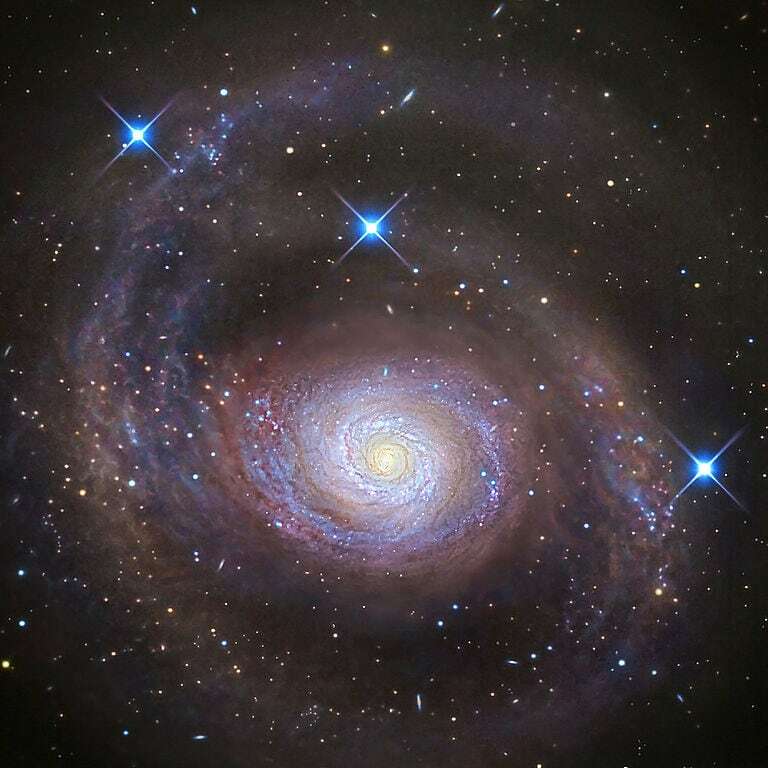 In 2008, a study analysing the rotation curves of M94’s stars and the density of hydrogen gas in the galaxy found that ordinary luminous matter appeared to account for all of M94’s mass, indicating that M94 had little to no dark matter. These findings were unusual because standard galaxy formation models can’t explain how a galaxy could lose its dark matter or how it could even form without a dark matter halo. The results of the study have not been confirmed yet. A large bright nebula discovered by Méchain, in 1781, immediately preceding the crown on Charles’ Heart [Cor Caroli]. It is a fine pale-white object, with evident symptoms of being a compressed cluster of small stars. It brightens towards the middle, and the gradual augmentation of intensity from the margin to the centre of this apparently orbicular object, is a direct proof of the real sphericity of the stellar mass. There are several small stars in the field, of which one in the sf [south following, SE] quadrant is double. Differentiated with the bright star Cor Caroli, from which it is but 2deg 1/2 in the north-by-west. Messier 94 seen in the ultraviolet spectrum. Image: GALEX, a NASA mission managed by the Jet Propulsion Laboratory. A beautiful object. From the very bright, large nucleus spring many bright, closely packed whorls, forming a bright inner oval 2’x1.5′ in p.a. about 110deg. These inner whorls show many stellar condensations, whose sharpness and proximity to the nucleus would seem to make this one of the most favourable examples known for the investigation of motions in spirals. Fainter, closely packed, rather uniform outer whorls bring the nebula to a size of 5’x3.5′. 17 s.n.